Have the butcher remove the meat from the lamb leg (provides approx. 1.7 kg meat) and hack the bone into pieces. Pre-heat the oven to 160 °C (circulating air 140 °C). Lightly hit and flatten the lamb meat, make slight cuts into the edges of thicker pieces and fold outward so that as large a surface as possible is created. Peel the onions, cut into quarters. Pluck a few leaves of parsley (they are added to the filling). Chop the parsley stalks into large pieces. Half the tomatoes. Peel garlic and chop finely for the filling. Clean the scallions, chop into fine rings. Stir the garlic, Dijon mustard, Provençal herbs and nutmeg together well. Salt the lamb meat, cover one side with the mustard mixture, sprinkle with parsley and scallions. Roll out the meat, tie together well using kitchen twine. Place the rolled lamb roast into the Magnum roasting pan. Add bone, onions, parsley stalks, thyme and bay leaves. Add 150ml of water and 100ml of vegetable stock. Close the Magnum roasting pan. Cook the rolled lamb roast in a preheated oven for 1 ½ hours. Open the roasting pan. Add the tomatoes to the roasting pan. Increase the temperature to 180 °C (circulating air 160 °C). Cook the rolled lamb roast for approx. 30 minutes until crispy brown, during this time remember to continually baste with the sauce and add more white wine and vegetable stock. Take the lamb roast, onions and tomatoes out of the Magnum roasting pan. Drain the sauce through a sieve. Allow the lamb roast to rest in the turned-off oven for a short time. Season the sauce with salt and pepper to taste, heat again for a short time. The premium KELOMAT roasting pan Magnum has the best qualities for a successful roast! It is well-suited for poultry and all dishes that need to cook for a longer time. 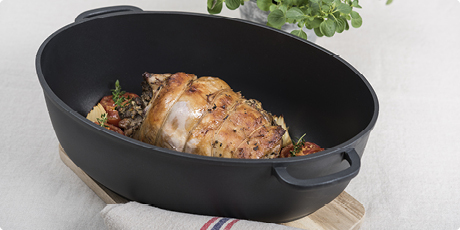 The high-class roasting pan has a contents of 8 litres and is entirely made of an extra strong aluminium casting, which is extremely energy-saving thanks to its optimum heat conduction. 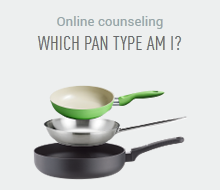 A special extra is the roasting pan lid, which can also be used as grill pan. 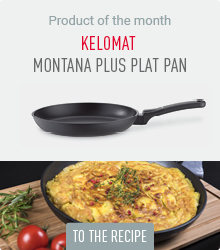 The roasting pan Magnum has an indestructible special coating on the outside and a KELOMAT Plus non-stick sealing on the inside. Thanks to the heat-resistant transparent glass lid you can monitor your roast without lifting the lid. The thermo base conducts heat rapidly and stores it for a long time in its core.